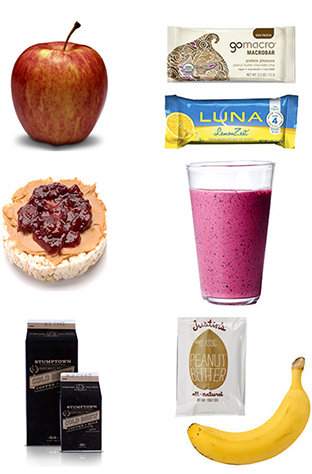 Check out the smart, satisfying snacks that keep our Pasadena instructors powered up! 1. Bananas because they are jam-packed full of nutrients to keep me going! 2. And Go Macro bars. My go-to power snack? I love protein shakes from Naturewell. Also I like Boba Bars! I hate myself for even saying this, but I don't usually snack that much. However, in between morning classes my new MUST MUST MUST HAVE is Stumptown's Cold Brew Coffee and Milk. I have it usually once or twice a week and that little jolt of caffeine is just the ticket for a sleepy morning. I'm constantly driving from place to place in LA so I always bring snacks with me so I don't crash (literally and figuratively). The most important things when it comes to snacking are that it tastes good and it gives me energy to fuel me through the day until my next meal. My favorite snack? Simple. A banana and peanut butter. Justin's peanut butter comes in these amazing little packets. Half of one of those and half of a banana? Bam. I honestly have so many Go-To power snacks, but I would say my favorite is: OH Yes with Kale smoothie From Juice Crafters. It's coconut water, orange juice, banana, pineapple and kale! It's the perfect boost right after class, or between two classes! When I need a quick snack before class, my “go-to” is always: A brown rice cake with almond butter and banana! With protein, fat and carbs, it gives me so much energy and keeps me full without weighing me down! It’s also, by the way, delicious. Peanut butter or almond butter on whole wheat toast. You get complex carbohydrates and protein and it takes no time at all. I eat it before my drive to Pasadena (which is 45 minutes) because it will keep me going for an hour or two but won't feel too heavy while I teach. Sometimes I put a little honey on top to satisfy my sweet tooth! I love a fruit protein smoothie. I just grab blueberries, strawberries and a banana, then add some kale, chia seeds, almond butter and a scoop of protein. I feel sustained, get a kick of energy, and my body feels super strong and happy! I'm all about keeping it simple and classic, so nothing beats a good old fashioned apple. Packed full of fiber, vitamin C, and the best kind of carbs to fuel your body during exercise, an apple is a light and satisfying snack that's easy to take on the go. Sometimes I'll even slice one up and pair it with some almond butter for that extra protein punch. I actually have two snacks I love: Boiled egg and Luna Lemon Zest bar. It's great to have a treat and a dash of protein together! The Luna bar is high in calcium and gluten-free. Check out these energized instructors in action at Soul Pasadena! Questions or comments? Email blog@soul-cycle.com!